The Steyr AUG was one of the first mostly plastic assault rifles produced back in the early 1970s. Many of its unique design features require that it have a heavily sprung trigger with a trigger pull weight of 10 to 12 Lbs. 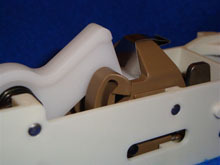 One of the AUGs unique features is a plastic fire control mechanism, specifically the sear and hammer. The problem I found with my rifle is that the trigger pull is not only heavy, it is rough and has a problem with "stacking." Stacking is the sensation that as you pull the trigger it will grab and release with each successive grab through the trigger pull, the pressure increases to get the trigger all the way back to drop the hammer. Stacking makes rifles less accurate by changing the point of aim as the shooter pulls the trigger. Attempts in the past to overcome this problem have been what some would think a logical solution. Lighten the trigger spring. The trigger spring is a multi-function spring. You cannot safely lighten the spring bias without making the rifle malfunction or even worse, be entirely unsafe. 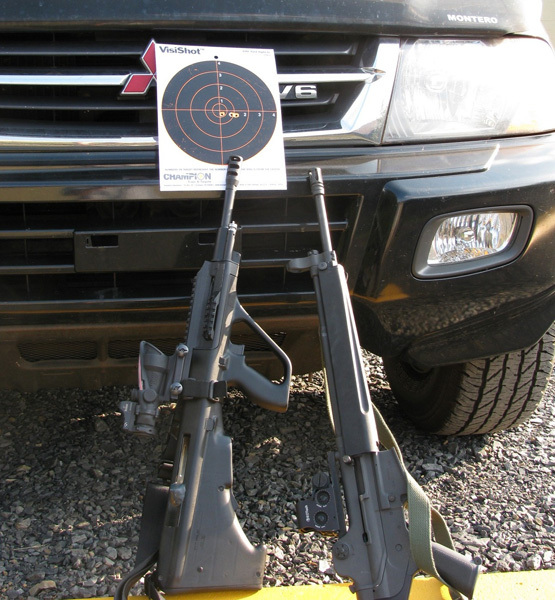 Competing products have demonstrated this safety concern by inadvertantly allowing the rifle to fire multiple rounds with a single trigger pull. While that may sound cool, it is uncontrollable and thus very dangerous especially when you are not expecting it to occur. The last point I would like to touch on regarding a lighter spring bias is the fact that, the Federal government does not care if your rifle fires in full-auto by accident or not. If you do not have a license to shoot full-auto, you will go to jail! There is no forgiveness should you be caught when your rifle malfunctions. Be safe out there. Change one of the surfaces from plastic to stainless steel. Neu-Trigger is a drop-in, plug and play solution that is incredibly smooth, light and rigid. For $30 and in one minute, you can have a custom trigger job that gunsmiths will charge you much, much more. Should you decide to remove the Neu-trigger, you have made no permanent changes that will degrade your weapon. Think re-sale. Would you buy a gun that has had its fire control mechanism buffed, sanded, cut and no longer looks like the unit the factory designed? Neu-Trigger is completely reversible. On a very small number of newer Microtech rifles, the hammer spur may need to be cleaned of molding imperfections to make it work properly. I provide simple instructions to assist buyers with the correction. Neu-Trigger requires no disassembly of the fire control unit and no special skills or tools to install. A pair of pliers is all that is required. The results are dramatic. The trigger pull weight will be over 2 lbs lighter and incredibly smooth. The stacking problem is erased and the point of aim is held steady. How does it work? By reducing the frictional coefficient between key elements. The Neu-Trigger allows the "factory spec" spring bias to be retained. This is important for several reasons. The trigger spring not only holds the hammer under the sear, even when the rifle may be dropped or bumped, it also operates the disconnector. The disconnector is an important internal part that prevents the rifle from accidentally "doubling" (multiple shots fired with one trigger pull). Can it be used on the full-auto versions of the AUG? Yes. 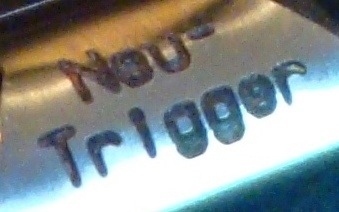 Neu-trigger only affects the initial trigger pull. It has no impact on the full-auto sear function. Because the trigger spring bias has not been degraded, the operator will still feel the same expected resistance when transitioning from semi-auto into full-auto mode. Safety was a big concern of mine. I wanted nothing that would make my rifle unsafe. Does it really lower the trigger pull without effecting the springs? Take a look at the comparison videos posted on youtube. Yes. Once payment has been received you will receive a video link to demostrate how to properly install it. Where can you buy Neu-Trigger? You can either buy it on Gunbroker.com or email me directly at neu-trigger@sbcglobal.net. Is it available for other rifles? Yes, there is a version for the FNH FS2000 available and it can be found on Gunbroker.com as well. Please note: Any modification away from the factory design has the risk of malfuncton. Please understand these risks before modifying your weapon. If you are not comfortable making changes, consult a trained gunsmith.